No Show Policy: No show reservations are subject to one night room charge and taxes, unless otherwise specified in cancellation policies. Minimum age for check in: Guests must be 21 years or older to check in. Smoking Policy: Smoking is not permitted on premises. A $500 daily cleaning fee will be applied to all rooms where smoke is apparent. Pet Policy: Dogs under 25 lbs are permitted. A $250 pet fee will be applied. 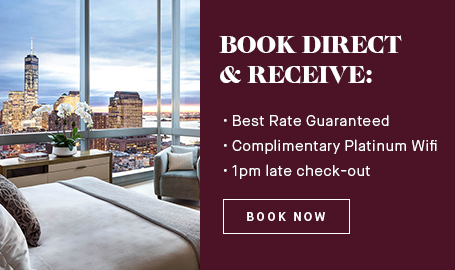 Taxes: The room is exclusive of sales tax at 8.875%, city tax at 5.875%, occupancy tax at USD $2.00 - $8.00 per night depending on room category, and Javits Centre tax at USD $1.50 per night. Check-in/check-out time: Check in time is 3:00PM, check out time is 12:00PM. If you anticipate an earlier arrival we would advise you to book your room from the night before as we cannot guarantee an early check-in. Premium: $10.95/day for moderate web surfing, streaming music and sharing photos and files. Platinum: $14.95/day for extensive web surfing, streaming video and fast downloads.